Robert Vincent (1901 - 1985) was very active in the field of recorded sound. In 1913, as a twelve year old boy scout, he made a recording of former U.S. president Theodore Roosevelt. 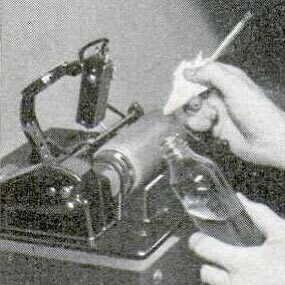 After Yale (1922), he spent ten years working for Edison himself, eventually inheriting Edison's own early wax cylinders. Between the world wars, he recorded a large number of famous voices, and as an army lieutenant in World War II he invented the V-disc system, sending recorded music to the fighting soldiers across the world. In 1962 he set up Michigan State University's audio library, bringing with him 8 000 recordings. He was also a pioneer in transferring cylinders to modern supports, in his case 78 rpm discs. This is described in an article in the december, 1939, issue of Popular Science. Unfortunately, the text mentions nothing at all about the way the cylinders were played, so all I know is what can be seen in the pictures. 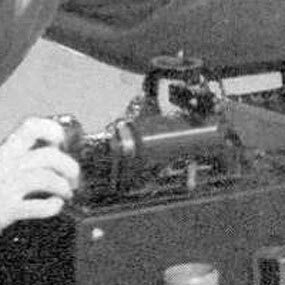 It is clear that he used an Edison phonograph, equipped with an electric pickup mounted under the original reproducer ring. The pickup is a black box, resembling in size and shape the one manufactured by Adrian Sykes (also on these pages), but mounted differently. Closeup of the pickup, folded up for changing the cylinder. It is attached below the ring for the original reproducer, and is hinged at one end. The pickup in position for playing the cylinder. Cutout from the photo above. The pictures on this page are from the december, 1939, issue of Popular Science. 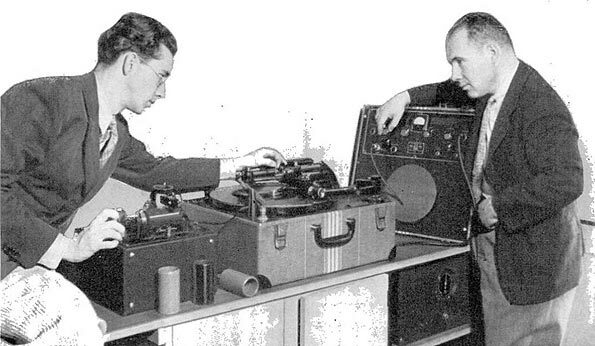 In the big picture we can see Robert Vincent to the right, with his assistant William Savory and the equipment for transferring sound from cylinders to 78 rpm shellac discs.